One of his lesser-known works is Incident at Vichy, which portrays a crucial moment in Europe's history - when the Nazi's surreptitiously assumed control of Vichy France. The moment is boiled down to a paranoid 40 minutes in a dank waiting room, where a group of men have been rounded up and are waiting to go through a door. What is behind that door, they don't know, but one-by-one they are summoned, and only one of them comes out again. It is not Miller's strongest work, and it has clunky elements to it -- the dialogue is full of Americanisms, which suggests that a cautionary tale about facism in Europe should be portrayed with American accents -- but the play is a fascinating snapshot of the confusion that must have taken hold in the area as the cars (not the tanks, yet) rolled in to mop up the undesirables. The massive cast represents a different reaction to the creeping influence of the onslaught of Nazism, as well as the various strata of Nazi thinking, from unethical doctors, to guilt-ridden generals who must follow orders or face death. 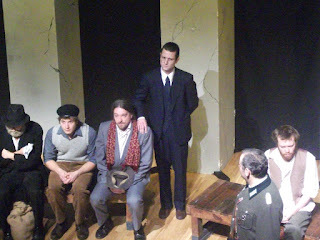 Mickey Mason (standing) plays a Nazi doctor, selecting his next subject (Glenn Hamill). The play pays particular attention to the apathy that the populace (including the Jewish population) paid to this impending and emboldened threat. One of the characters sits silently clutching a sack throughout, most nakedly represents the passive Jew, but nearly all of them possess that inaction, whether or not they know how much danger they are in. I played Le Beau, a (literally) starving artist, who is the first to start asking questions about why they have all been brought here ("You don't get a special flavor, huh? A racial flavor? "), but his well-placed paranoia gives way to hunger-induced weakness. Miller is making the point that if the artist can't speak their truth, no one will hear it, and yet what is always the first casualty of repressive regimes; art (Nazi book burning, ISIS destroying ancient Persian idols) and artists (Ai Weiwei in China, Salman Rushdie in Iran). You're like the people who look at my paintings. What does this mean? What does that mean? Look at it, don't ask what it means. You're not God, you can't tell what anything means. I was walking down the street before. A car pulls up, a man gets out and measures my nose, my ears, my mouth. Next thing I'm sitting in a police station, or whatever the hell this is here. And this in the middle of Europe, the highest peak of civilisation! After the Romans and the Greeks and the Renaissance and you know what this means? How, Miller asks, could the civilisations who brought us such enlightenment in centuries past, be beholden to such naked barbarism? Other characters are more concerned with preserving their status quo; Merchand (a merchant! 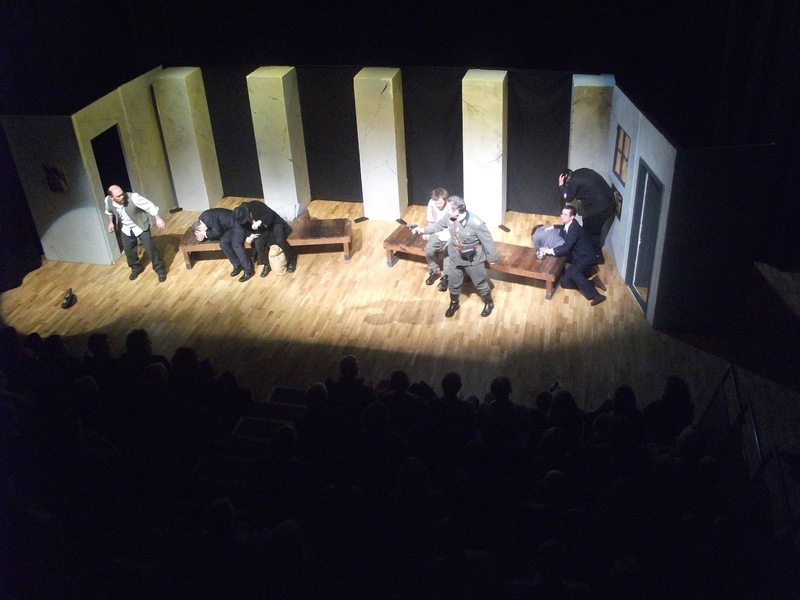 But sitting in for the rationalist capitalist; played in our production by Jack Geary) doesn't quite see what they are so worried about, this is merely rational precaution in the midst of war. This 'rational' denial exists in every place where there is one section of the population demonised - the other sections clamber for whatever rationality they can. Or to put it more bluntly: "The Only Thing Necessary for the Triumph of Evil is that Good Men Do Nothing." Merchand's denial was mirrored by Merceau (played by my good friend, Glenn Hamill), who had heard something about concentration camps with furnaces where they would burn people, but that wouldn't make sense - the Nazis require labour, they are teaching them skills to put them to work. It is this attempt to normalise this behaviour that earns the riposte from Leduc, "You cannot wager your life on a rational explanation." 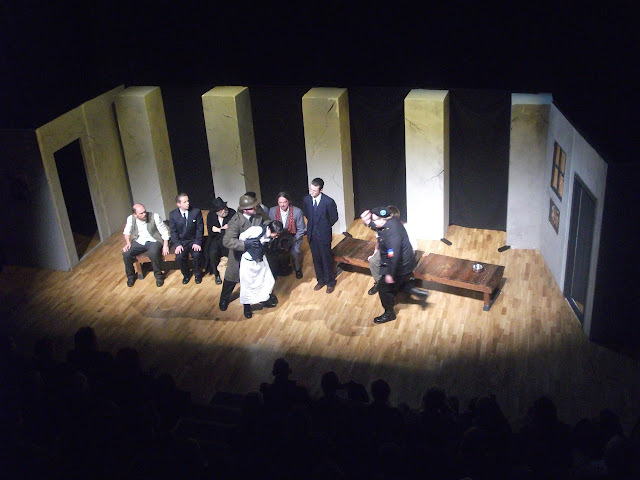 The Police Captain (Brian Kennedy) at the end of his tether lashes out on the captives. Eventually the captives are whittled down to the silent Jew, Leduc the doctor with a military background (a commanding Matt Faris), and Von Berg an Austrian Prince who was interred because he had a different accent than local people (Ed McCann). Von Berg represents the upper classes (and the still-present European aristocracy), who wouldn't league with the Nazis, but did little to stop their progress. He claims that he never insulted a Jew, held all men in high regard and can hold no responsibility for the actions of the Nazis. However, the absolution he seeks is not granted by Leduc - if anything his position of authority and privelige imbued him with more responsibility to act. Von Berg: What is there left if we do not have ideals? Leduc: You are left. With or without ideals, you are left... It's difficult to listen to sentimentality, even if it's well-meant. Von Berg: Doctor, I had no intention of being sentamental. Leduc: Oh but you must! You will survive. You will have to sentamentalise it, just a little, just enough to share this. It's no reflection on you, but it's enough to make one furious. In fact, Von Berg suffered in his own way - an orchestra he had hired were lifted in front of him, as they played, and he was driven close to suicide by the indifference of his friends. But Leduc's word hit home with the Prince, and he gives his freedom pass to Leduc, who has a wife and child hidden outside of the town. 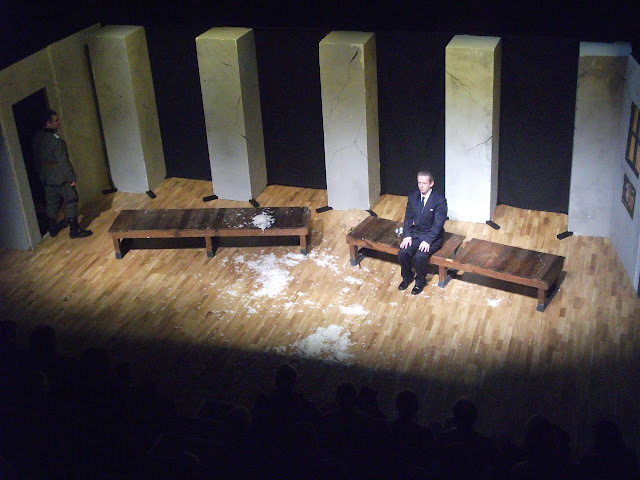 Von Berg sits alone in the detention room, having sacrificed his freedom. 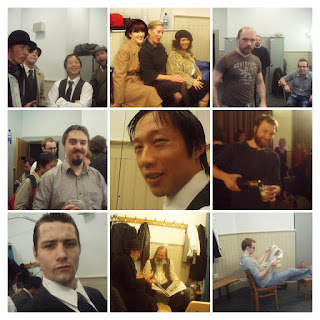 Arthur Miller's Incident at Vichy, Crescent Arts Centre Belfast, 2010. The play has recently come to be considered a lost classic of Miller's oeuvre, and is currently being revived in London's Finborough Theatre, but it had gone decades in the wilderness before Adrian Cooke brought it back to the stage with Fringe Benefits. 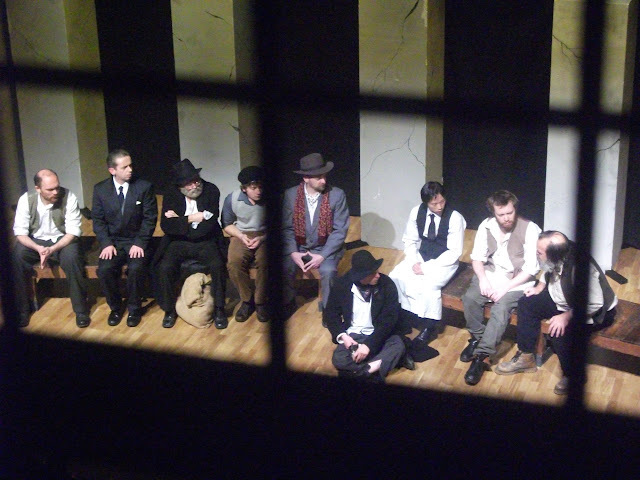 The gestation period was particularly long, with over six months elapsing between auditions and production, but it proved worth it in the end - the crowds were enrapt and it was revived early in 2011 as part of the Jews Schmooze festival in Belfast, where we performed it in the Belfast Synagogue. These memories are tinged with a personal sadness though. The character who represented the burgeoning Socialist movement was played by the late Tom Dart, who died unexpectedly last year. He was a huge character on Belfast's acting circuit, and as you can tell from the photo below, he always had a huge smile and lightened the mood with his humour. Arthur Miller's Incident at Vichy 2010.